Niagara Falls has long been said to be the honeymoon capital of the world. While this destination is incredibly romantic, there is more to than just that. We spent some time here as the last stop of our New England tour. It was a great way to end our trip as this spot is full of activities, great food and drinks, and of course the romance and splendor that is part of the splendor that is Niagara Falls. We arrived by train and took Uber to our hotel. We decided to travel into and stay on the American side because there were more, less expensive train options. 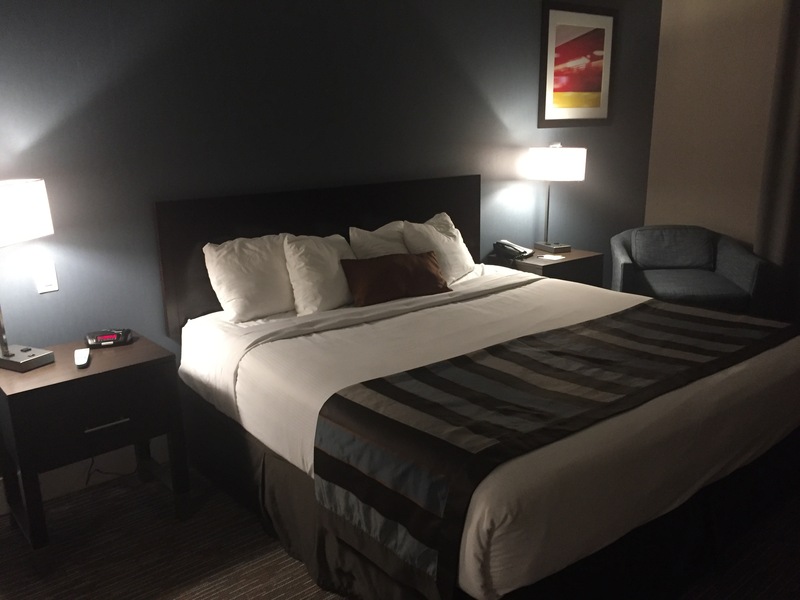 We picked the Wingate by Wyndham Niagara Falls and highly recommend this hotel! It had a great free breakfast and large wonderful rooms! The Wingate by Wyndham Niagara Falls is the perfect home base for a trip to Niagara Falls! The hotels were less expensive on the American side too. Our hotel was two blocks from Niagara State Park, so everything was well within walking distance, including the Canadian side of the falls. Our full day spent at Niagara was unexpectedly busy. 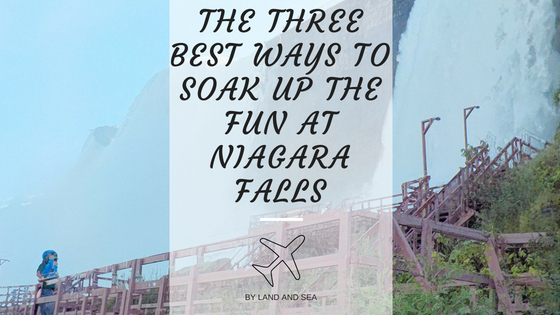 During our time in this beautiful twin-city area, we found the three best ways to soak up the fun at Niagara Falls! We decided to head to Maid of the Mist first thing in the morning. This was great because there were no lines and the boat wasn’t at all crowded. Usually you see pictures of people crammed in like sardines. Instead, we had plenty of room to move and walk around, capturing great views of the Falls as we floated closer. There was no shortage of water coming our way! The water crashes so fast, your poncho will fill up with rushing air. Afterwards, we strolled up the walkway adjacent to the falls for a close up look. As we had already taken our ponchos off, this is where I unfortunately discovered that my rain jacket is merely water resistant, not fully waterproof. This was a surprise to me as I’ve had this jacket for years, and even experienced hurricanes in it, and never had an issue until now. I was sopping wet! I guess that just goes to show the power of Niagara Falls. If you’re researching your options you may notice there is also a company called Hornblower Cruises. The only difference between the two is that Maid of the Mist operates on the American side while Hornblower operates on the Canadian side. Otherwise, it is the exact same experience. On a whim, we decided to experience the Cave of the Winds immediately after the Maid of the Mist. This is also accessed on the American Side. There is no doubt about it, you will get soaked doing this, but it is worth it! All visitors must watch the obligatory historic video session first, then everyone is given time to get ready. Staff supply visitors with a poncho, a plastic bag to store shoes and accessories, and a pair of souvenir sandals to switch into. Again, it is best to have a waterproof camera or case to capture this watery adventure! After going down an elevator to the base of Bridal Veil falls, the sound of the roaring water is deafening. Be prepared to shout to your travel partner(s)! Walking around the area’s decks gets you so close to the cascading water that it oftentimes washes over your feet. There is no way you will come out of this dry! The highlight of this experience is backing into The Hurricane! The force of the water is so powerful, you cannot walk in face first. This is an area of the Falls where you can feel the incredible power of the water rushing over you. Seriously, if you are sore from traveling, the intensity of the water works much like a shoulder massage. 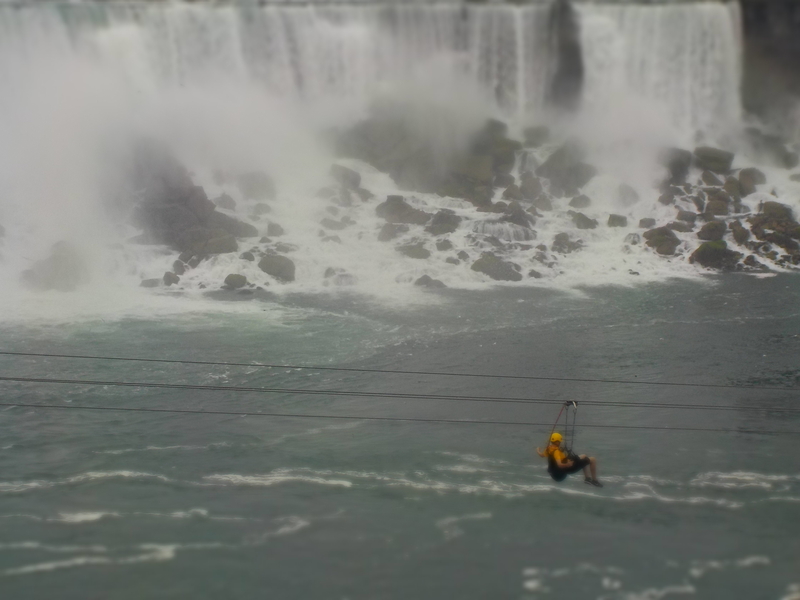 Accessible only on the Canadian side, don’t miss the Mist Rider zip line adventure with WildPlay Niagara Falls. If you are on the American side, all you need to do is grab your passport, a handful of quarters to cross the bridge, and walk across to Canada! WildPlay’s facilities are beautiful and not far on the other side of the bridge. You can buy tickets in advance or at their office. You cannot miss the excitement of this spot! Having been ziplining a few other times, I must say this was one of the most secure operations we’ve gone through. Their safety is top notch and the ride toward the Falls is incredibly smooth. Riders blast simultaneously toward the water on parallel lines. There is no bounce, no spin, no need to think about stopping yourself. It is truly effortless. With your arms out to the side, you truly get the feeling of flying! 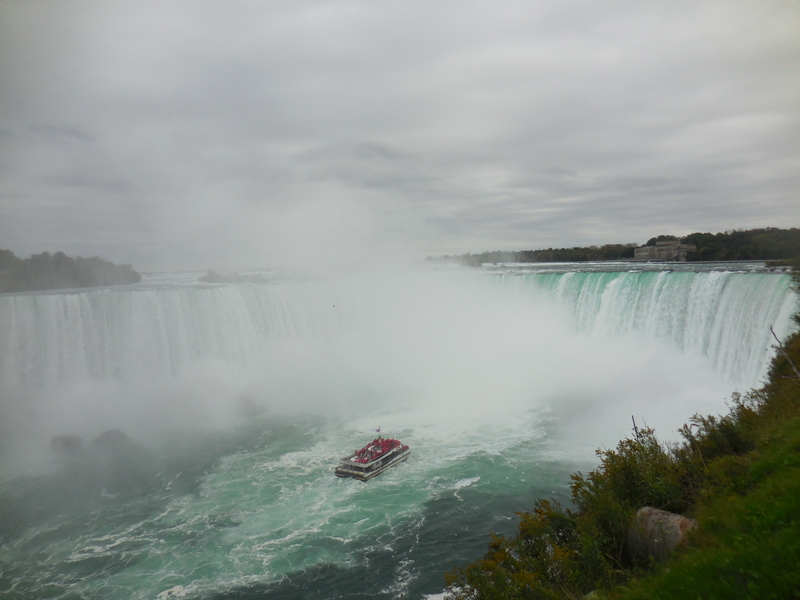 It is fun to soar over the onlookers below while blasting toward Horseshoe Falls. You will feel the powerful spray hit your face and smell the fresh churning water as you fly closer to the Falls! What a way to take in Niagara Falls! Everyone waiting to get secured for their turn on the Mist Rider! These three activities are the best way to soak up the fun at one of the world’s most beautiful, powerful, and amazing natural wonders! If you’re planning on doing these water-related activities, we recommend not spending your time getting ready prior to these things either. It is just a waste of time as you will get entirely too soaked! After a great day of being wet and well entertained, it was time to dry off and eat. We ended our day in Niagara Falls with dinner and strolling around the area some more. By the time we returned to our hotel, we had walked over 27,000 steps, or 11.68 miles! What a great, and exhausting, way to cap off our trip to New England! Which of these Niagara Falls activities have you added to your travel bucket list? Tell us in the comments below! This post is shared in the Feet Do Travel Blog Link Up. Like this Post? Why not PIN IT for later! 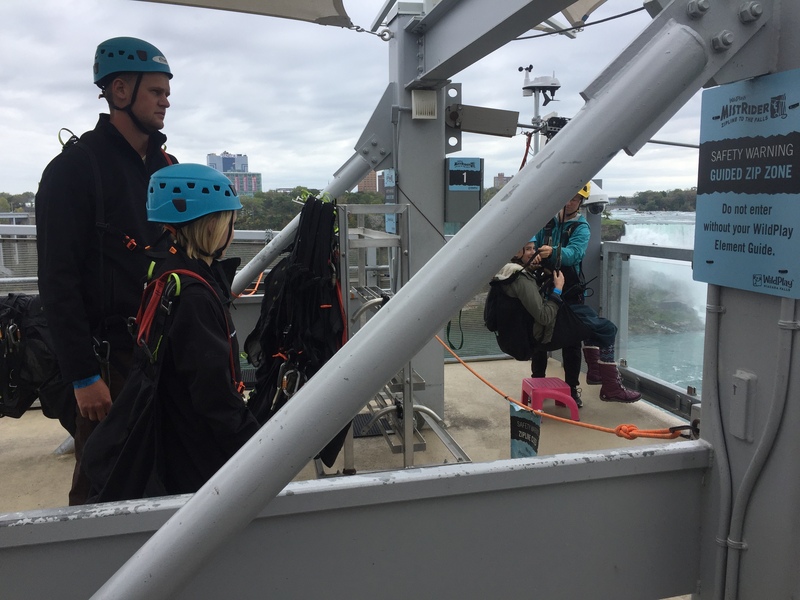 Disclaimer: We received zip line ride compliments of WildPlay Niagara Falls and send out a big ‘thank you’ for hosting our visit! This post also contains affiliate links. If you make a purchase, we might make a little extra travel money, at no extra cost to you. As always, all opinions are our own. Your pictures of the falls are amazing!! Love the one of the “ponchos”!! 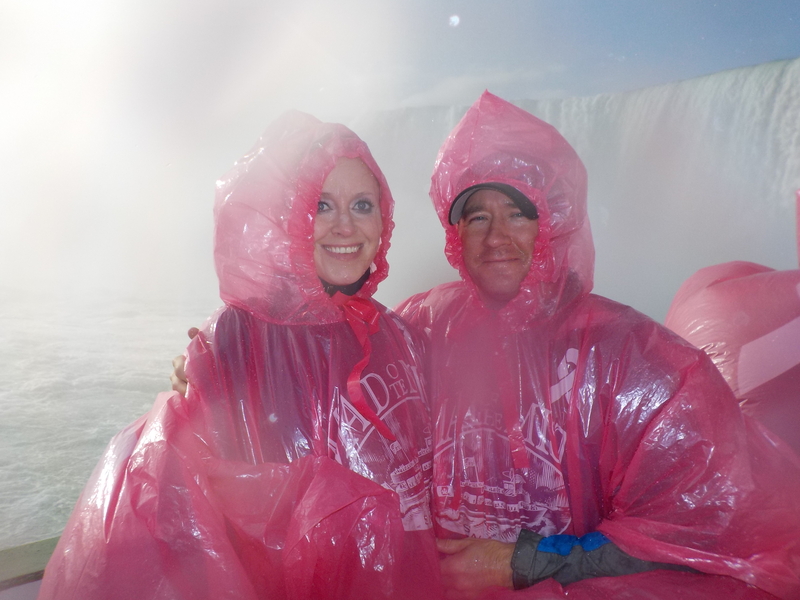 I’m glad you can enjoy the falls when you’re not on a honeymoon too lol. ’cause I don’t see that happen anytime soon! Love the pics, that zipline looks seriously daunting and you really rock those pink ponchos!! OMG! You really know how to have fun lol! I looove this idea! I’ve never been in the Niagara Falls, so I’ll save this post for later. The Mist Rider zip line sounds so much fun! Heading to Maid of the Mist early in the morning is such a good tip. I always see pictures of the Niagara Falls with so many people, and you definitely don’t want that! The zip lining looks amazing! We also prefer to visit on a weekday- it’s SO much less crowded than on a weekend! That’s a great point!! We were there on a Thursday/Friday and it was really pleasant! 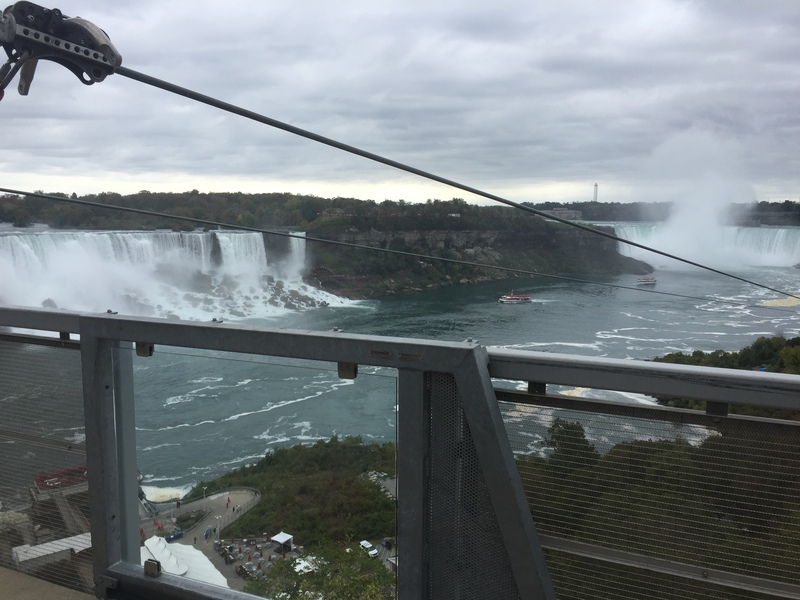 I’ve heard a lot about visiting Niagara Falls but I’ve never heard that there is a zip line there, that sounds fantastic. What an awesome experience to have by such an amazing view! I love going to cave of the winds! Just be prepared to get soaked. They often do fireworks during the summer at the falls as well. I’m always curious to see the US side veils. We went to Canada side. I just have the chance to see it from US side. But going to the ferry kinda great. I have lived in Chicago, US for four years and I have never managed to go there. Not a big regrets but maybe next time in Chicago I’ll make sure to go there too. Niagara falls is such a gorgeous setting. I would love to explore and click pictures of this beautiful place .Also Zip-lining sounds really interesting. So will try the thrill on my trip. The zipline looks fun. But im not sure though! Im scared of heights! Somehow i should probably do it to complete the Niagara Experience. What do you think? Ah Niagara falls! We live an hour away from them and have seen them in every season but just can’t get enough of their beauty and charm. Although, I must say ziplining is a new way of experiencing them, not sure if I’m that brave! I went as a child but now reading about your adventures, I am thinking I need to revisit it as an adult. Sounds like to much fun! I went to school in Rochester, NY so ive been to Niagara many times! I’ve been to the Iguazu falls this February and they are very impressive – compared to the Niagara falls, though, they look like a drizzle. Fantastic pictures, so powerful! However, never will I ever doing this zip-thing; NEVER! I’ve been to a lot of falls but never been to Niagara. But it’s already on my plan next year when I visit Canada. And that zip line pic is dope! I don’t think I can do it. Last time I did, I got stuck in the middle because I was too light lol. When I went I was on the Canadian side, but didn’t see any zip line?! Also, I never heard of it being a honeymoon destination. I learned a lot, thanks! Wow, the view of Niagara Falls is so stunning! Is there an admission fee to go there? I never thought of Niagra Falls as a honeymoon destination, but reading this made me understand why it’s a popular couples’ destination. Wow, you revived my memories of Niagara Falls. 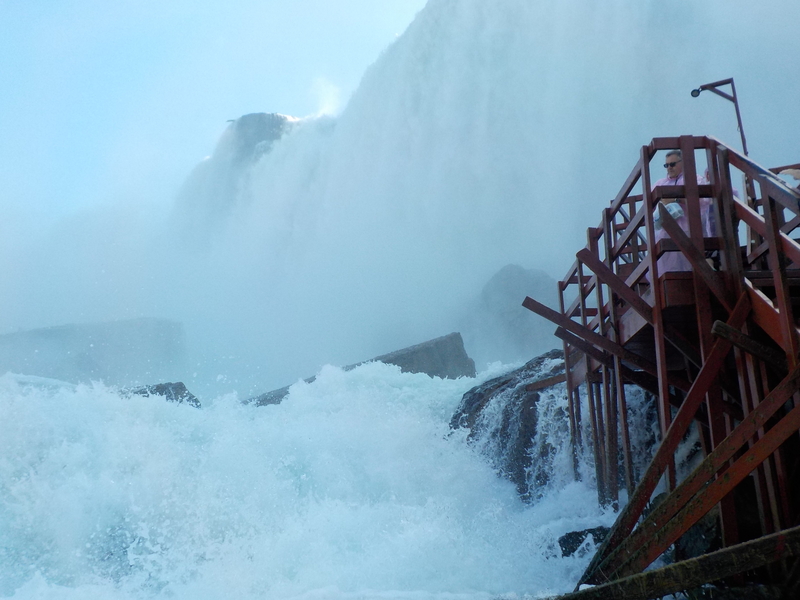 I loved the Maid of Mist and Cave of winds as to have gushing waters on our face is truly wonderful. I did from US side and I think you have done from Canada side. 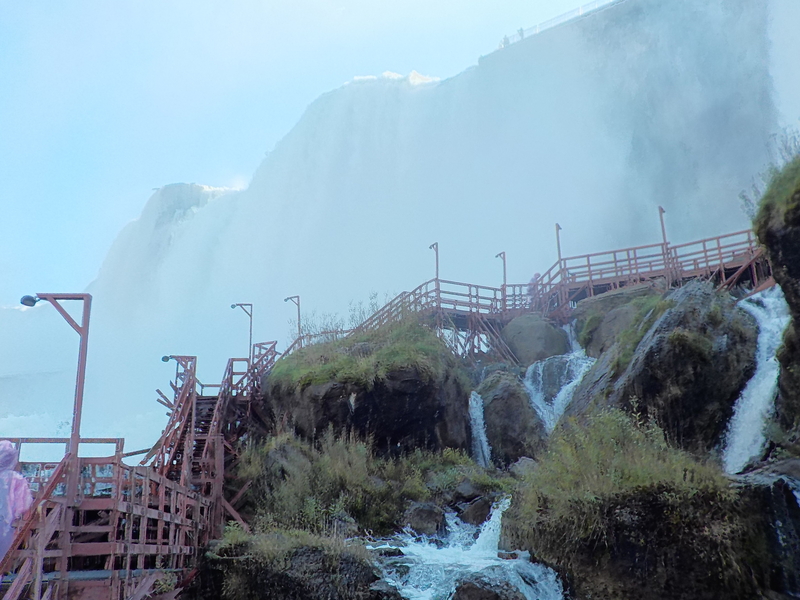 It’s really fun to read this post.. l have never been to Niagara falls , but I can feel the fun. This post strengthens the idea to be at Niagara for atleast once in the lifetime . amazing post. Niagara falls attracts me to visit there. Its on top in my dream list. but I’ve never heard that there is a zip line there, thanks for sharing. Even though we were in the US for a long time, somehow, Niagara Falls could never happen for us! Did not know it’s called the honeymoon capital of the world. Maid of the mist looks real fun. And that view of the falls is just magical. Meal after after walking 27,000 steps would have tasted the best! Niagara Falls continues to be on our bucket list! Before I visited the Niagara Falls, many people told me it’s overrated. I couldn’t disagree more, it is one of the most beautiful places on our planet! Wow! Your post and photos are amazing! I’ve read a lot about the Maid of the Mist but I had no idea about the Cave of the Winds. Thanks for the great tips! 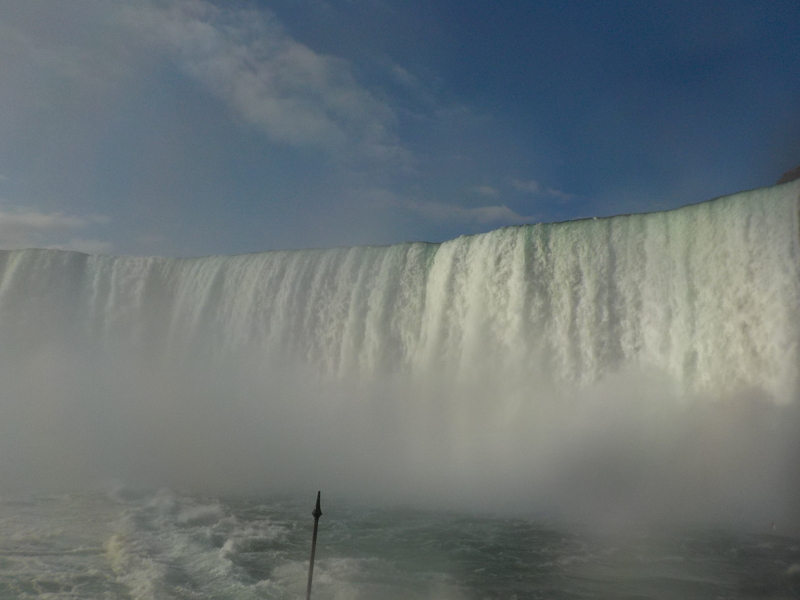 Wow your pictures of the Niagra falls make me want to visit it right now. I have seen so many pictures on blogs and insta but these are so .. well, real! And the fiercesness of the falls is unmistakable here. The last time I was at Niagara was in 1990 long before the zip line I think! I took the maid of the mist boat ride which was great! I would love to return with my husband maybe try the zip line too this time! I would love to visit Niagra Falls in the near future! I think it looks amazing! Great way to see Niagara Falls. Love the photos. How exciting you did the zipline. That is so what I wanted to do while there. Must do that the next time I visit. What a LOT of water! I would love to visit someday. And the pink raincoats are adorable!